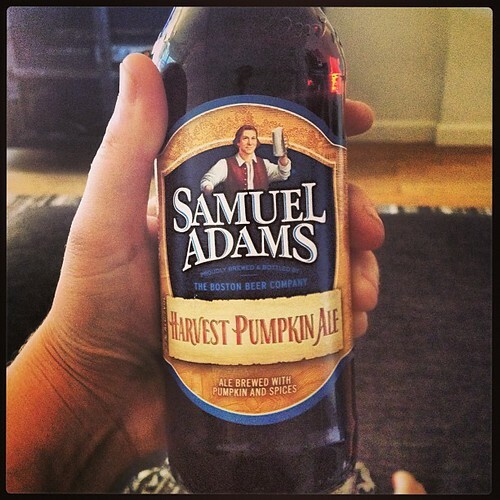 We start with a beer that slipped through my fingers last year: Sam Adams Harvest Pumpkin Ale. It’s a limited edition, so when I saw it in the store this year, I had to grab it up. Being a general fan of Sam Adams brewing, I figured that they would do it right. And they do. There’s just the right amount of spices that blends with the ale so that one is not overpowering the other. A pretty solid showing. The only thing is that I don’t know if I would want to drink more than one, so maybe that means something. They actually use pumpkins in the brewing too, which is cool. I think next year, I’m going to try brewing my own batch. I know it’ll take some time getting the recipe right, but it’ll be a fun venture. Plus, it’ll be the ultimate pumpkin beer. ~ by Rori on September 22, 2013.